Precision Metal Group has lead the way in mechanical, structural and electrical engineering. We have big ideas and ambition, yet being a family business can offer a real personal approach. And again, Precision Metal Group leads the way operating to the highest standard with another certification achieved! 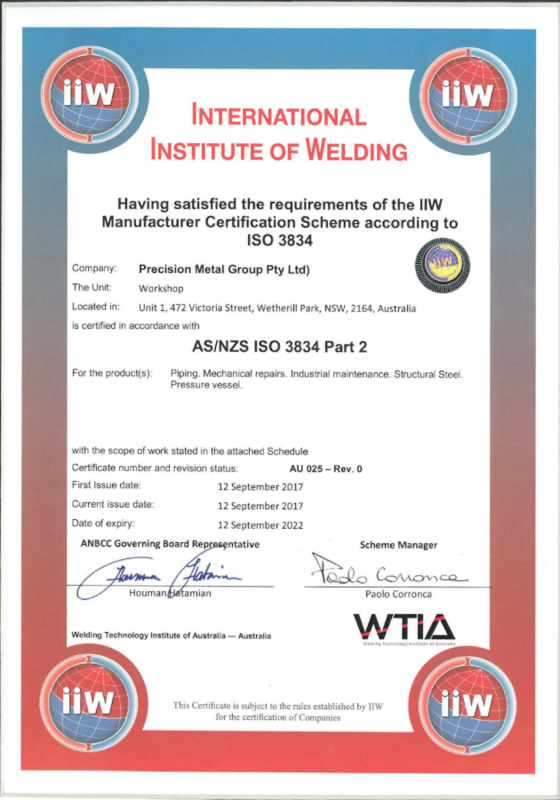 We are proud to announce that in September 2017, Precision Metal Group became a certified ISO 3834-2 company by WTIA. The highest level of this certificate. This new certification in combination with our previous certifications places Precision Metal Group in a unique position, offering our customers complete confidence. We stand apart from our competitors as few Australian companies have achieved this level of certification under one roof. So what does this ISO3834-2 certification mean for our customers? It is a quality requirement for fusion welding of metallic materials. A certified company has been extensively examined, with compliance in tern affecting the production costs and quality. My team has worked hard over the past few years to achieve this certification. We’ve added engineers and inspectors with highest qualification in Australia to improve our system. Our customers deserve the best in quality and price, and this new certification is just another way Precision Metal Group can deliver. Im thrilled to share this news with you as we continually strive for success!